China has a long tradition of lacquer-coating art and lacquer painting, but lacquer painting was not considered as an independent painting form. In 1962, Vietnam polished lacquer painting works was exhibited in Beijing and Shanghai as an independent painting form, which inspired Chinese artists to begin their exploration of the modern Chinese lacquer painting art. Qiao Shiguang is one of pioneer in the exploration of modern Chinese lacquer art. He was born in Guantao County in Hebei Province in 1937. He began to study in the Wall Painting Department of Central Academy of Fine Art from the year 1956, and worked for his Master's degree on lacquer painting in the same academy in 1961. He experimented with the new skills in lacquer painting under the supervision of Pang Xunqin. Qiao is now a professor in Central Academy of Fine Art.Qiao pays attention to a combination of the features of lacquer and painting in his works, which keeps the tradition and culture of this art form, and at the same time, infuses it with creativity. "Water-sprinkling Festival" is his representative work. His ingenuity was fully demonstrated in the organization of this picture. In the front of the picture are the figures of a group of Dai (an ethnic group of China) girls in picturesque disorder, while the background are the dragon-boat race going on in the river, and the exciting crowds which set off the festive atmosphere. 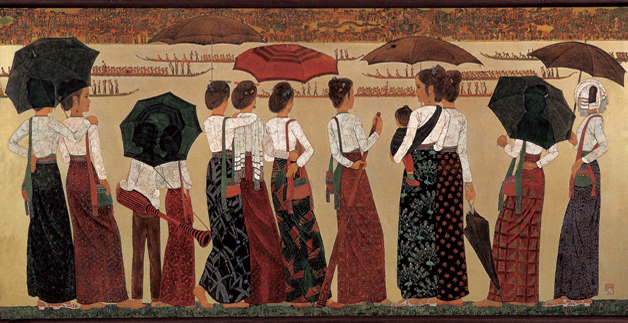 The artist's proficiency in lacquer art is shown in his rich artistic approaches. He uses egg shell to produce the white coat, and the colorful skirts was painted with a combination of silver leaf lacquer, and mother-of-pearl inlaid techniques, silver clay color painting provides the best background for those girls in colorful dress. The whole picture is elegant, gorgeous, delicate, and classic.